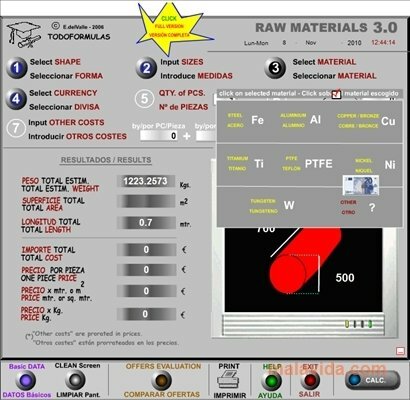 RAW Materials is a useful tool that will allow you to calculate various details about the materials you work with. You'll be able to calculate the weight, surface, length and price of various materials like aluminum, iron, bronze, titanium, Teflon, or nickel, among others. To know the exact measurements can be very useful to compare the price of materials, or to adjust the amounts in material orders. The application is very easy-to-use, because you'll only have to follow the different steps: choose the shape that you want to calculate, the dimensions that it has, the material that it is made of, the currency that you work with, the amount of pieces, the price and other possible costs. Once you have input all this data, RAW Materials will calculate the different features of the piece, like the weight, the surface, the length and the price. 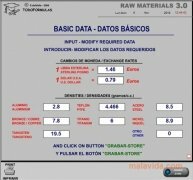 RAW Materials allows you to print the results, and to compare them with the different offers that you have available. Try out RAW Materials and make the most of the materials that you work with; you'll be able to save money and time.